SAS 2.0 Non-RAID Host Adapter, PCIe 2.0 x8 interface, external connection via 2 x SFF-8088. 6G performance. Drivers for all major OSs. 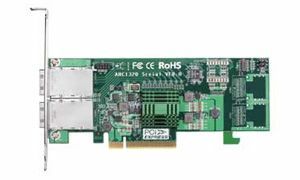 The Areca ARC-1320 series is a low profile host adapter. It brings the fastest available connections to 6Gb/s and 3Gb/s SAS/SATA interface storage on anycomputer, workstation and server with PCI Express 2.0 interface.